Add all your ingredients together in the infusion jar and tighten up the lid. Shake well and put into your refrigerator. Shake every day, checking for the flavor profile each day. Distill for a minimum of 2 weeks and up to 1 month (I have heard of some people letting their liqueur perk away for a year but I never have that kind of patience). When the liqueur has reached the flavor level you desire get out your straining tools and patiently pour it through the coffee filter lined metal strainer to remove any sediment. 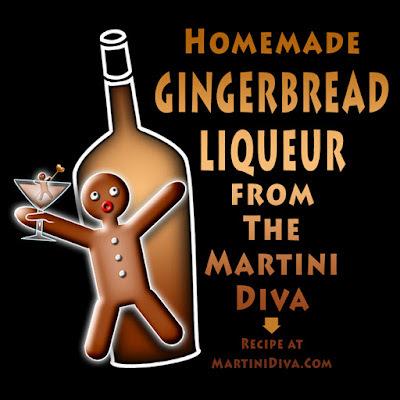 You're now ready to bottle up and label your home made Gingerbread Liqueur for your own use or as a gift. 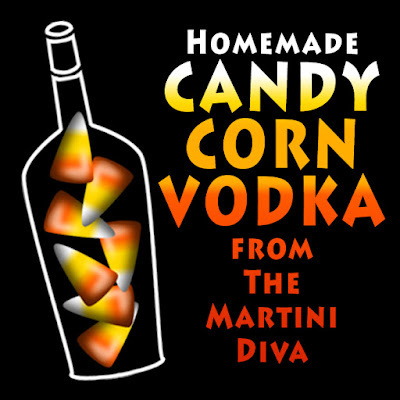 Making your own Candy Corn Vodka is so easy and quick you'll wonder why you haven't tried it before! Now, technically, because there is sugar in this that makes it a liqueur but the big brands don't seem to make a differentiation so why should I, right? 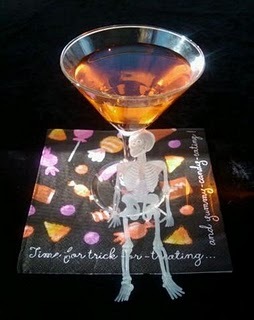 Either way it makes for some fun cocktails and a great way to celebrate Fall and Halloween. Once your infusion has reached the peak of candy corn flavor it's simply a matter of straining it. To do this simply pass all the liquid through a metal strainer to get out the larger chunks (if there are any left which there probably won't be if you infuse the candy longer than a few hours!). Then line that strainer with coffee filters and strain the rest through in stages, changing out the coffee filter with each pass, until you have strained all the liquor. You are now ready to bottle, label and enjoy or give as a hostess gift at that Halloween party you're going to! Tools: baking sheets, large metal strainer and coffee filters or cheesecloth, measuring cups and spoons, citrus zester, large glass jar (infusion jar) for distillation process, second large glass jar for filtering process, decorative bottles for finished liquor, labels. Cut your pumpkin into chunks (about 8" or so), place these flesh side down on a baking sheet and bake at 400 for about half an hour or until the flesh is tender. The baking time will depend on the size of your pieces. Scrape out the cooked flesh from the shells into your infusion jar. Add the lemon zest, the Pumpkin Pie Spice and the sugar. Seal your infusion jar and place in the refrigerator. Let this distill for a minimum of one week and up to two weeks. Shake the jar up whenever you open the fridge or at least once a day. Once your distillation is complete you can set up your filtering station. I like to do a quick strain through a large sieve or metal strainer to get out the larger, chunkier elements. This will speed up the following steps. Place your metal strainer lined with coffee filters or the cheesecloth over your second large jar and pour your infused pumpkin liqueur into this in stages. After each stage dump out the sediment remaining. You'll do this until all the solids are removed. OPTIONAL: If you want a really bright orange colored liqueur you can add a few drops of orange food coloring at this point. 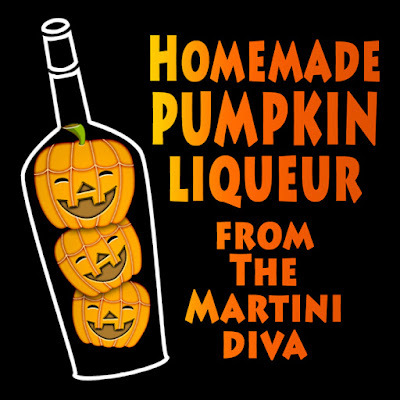 Pour your strained pumpkin liqueur into your decorative bottles, add one of my personalizable cocktail labels or my customizable Halloween Labels and you're ready to give them as gifts and enjoy in cocktails! You can also use rum instead of vodka, but remember that while vodka doesn't have a very distinctive flavor, rums do and this will affect the final flavor of your end liqueur. Try both and see how you like them. 32 ounces of canned pumpkin puree can be substituted for the fresh but you'll lose some of the great flavor you get from the freshly baked squash. A friend gave me a bunch of fairly ripe bananas. I don't really eat ripe bananas, I like mine on the green side, but they are great for banana bread. Unfortunately I'm in the middle of getting my next cocktail book ready for the holiday season sales and I have little spare time to eat, let alone bake. 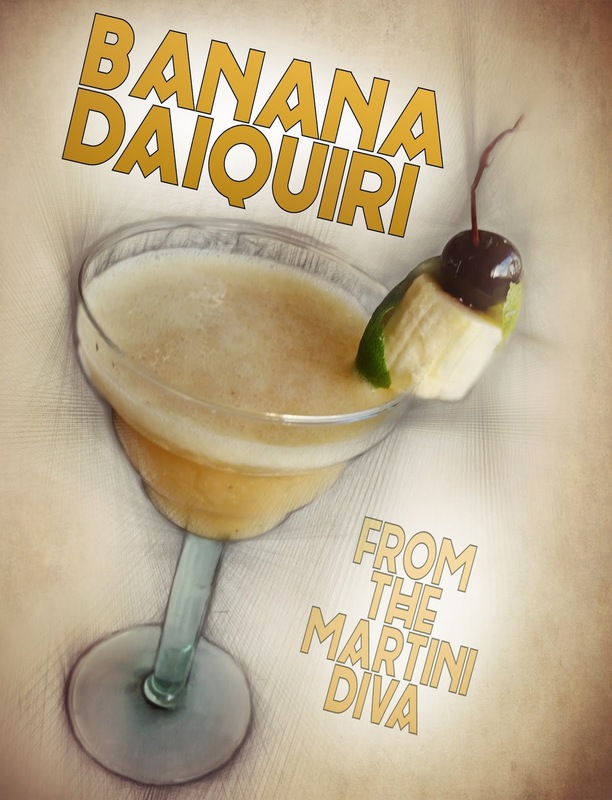 But a drink only takes a couple of minutes to make and that book deadline really makes a cocktail a necessity for my sanity during marathon book editing sessions. 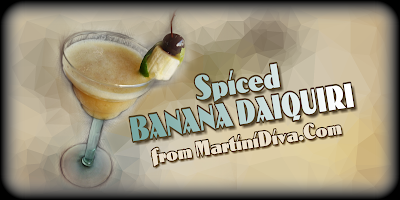 So, those bananas got tossed in a blender with a few other choice ingredients and in a few minutes I was ignoring my computer for a few blessed moments of serenity and delicious banana booze. Ripe fruit is great for cocktails because it's sweeter and releases it's juicy flavor readily without the need for a lot of added sugars. Healthy, delicious and relaxing, can you ask for more? DIRECTIONS: Chill you glass in the freezer. Add the rum, lime juice, banana, honey and ice to your blender and pulse until blended smooth. Pour into your chilled glass. Garnish and enjoy!